The final link of the downtown streetcar already has huge demand. Killing it would be a devastating mistake. For a city with so much luck, Seattle has done repeated face plants in attempting to build necessary rail transit. Never miss an opportunity to miss an opportunity. Shoot ourselves in the foot and reload. The most notorious mistake was the 1970 failure to pass bonds to build a regional subway system, which would have been 75 percent funded by the federal government. If voters thought rejection would prevent growth, they couldn’t have been more wrong. The city population ballooned from 531,000 then to nearly 725,000 in 2017. Which brings us to the Center City Connector, 15 blocks of streetcar to make the 60-block system into a complete network. In March, new Mayor Jenny Durkan halted the project. A review showed that the $150 million extension could cost $200 million. For context, the city’s operating budget is $6 billion a year. Also, construction materials and labor are more costly in this boom, and steel will become even more expensive with the Trump tariffs. Since then, the mayor’s office has mostly assumed a tomb-like silence. KPMG was hired as a consultant to study the finances. But Durkan’s self-imposed deadline of June 19th to make a decision passed with no resolution. The city is paying KPMG $416,000. The global firm is primarily one of the Big Four auditors, with little experience in transportation projects. That sounds suspiciously like an effort to justify killing this essential piece of infrastructure. This would be a mistake of historic proportions (again). The Connecter is the centerpiece of a streetcar network that began with the line through South Lake Union, with another section from First Hill to Pioneer Square. The incomplete system already serves the dense innovation district centered around Amazon and Fred Hutch, Seattle Central College, Seattle University, the hospitals of Pill Hill, Chinatown and the International District, and connections at King Street Station for Amtrak, Sound Transit commuter rail and light rail. Ridership has met expectations and been rising, especially on the First Hill line. The Center City Connector, which would mostly run along First Avenue from Pioneer Square to meet the South Lake Union line, would be an especially sweet spot for passengers. Among the destinations: Pike Place Market, the Seattle Art Museum, and, nearby, the waterfront and the ferry and cruise terminals. About 154,000 jobs and 54,000 residents are within a quarter mile of the line. It’s projected to carry 25,000 people a day in its opening year. Among them would be workers, tourists and less-advantaged citizens without easy access to transportation. “The strong numbers indicate these projects are major economic-development drivers” Don Blakeney, vice president of advocacy and economic development for the Downtown Seattle Association, told me. The combination of streetcars, light rail, even the monorail is imperfect, to be sure. We’re backfilling from years of bad decisions. Cities in Europe, and increasingly in Asia, have extensive systems of well-maintained subways and above-ground trams, not to mention high-speed intercity rail. Vancouver, B.C., and Toronto are light years ahead. Most of America is stuck with a 1970 transportation system. Seattle has become denser, with more density to come. This requires better transit. Buses alone won’t do it. They can’t carry as many people as rail or offer the same comfort and reliability. Anybody who used to endure the 45-minute ride from the University of Washington to downtown and now takes the quick shot via light rail can attest to this. Buses are an essential node, but we’ll need everything to keep the city mobile. Yes, cars and bikes, too. Killing the Connector also means giving up $75 million in federal funds — and at a time when the Other Washington is hostile to the needs of cities. Such a move would hurt Seattle’s credibility if it seeks federal transit money in the future. Also, the city has spent about $45 million on the Connector already. Killing it would also be deeply unfair to the International District/Chinatown. 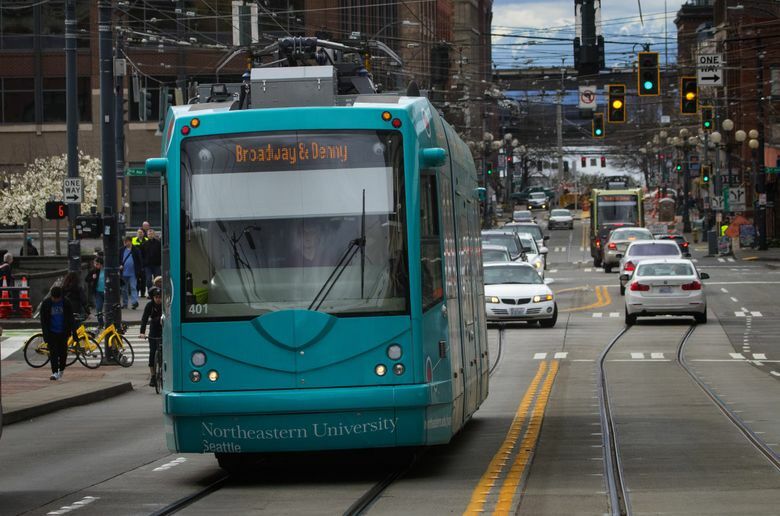 A letter from business leaders said, “These neighborhoods endured years of streetcar and utility construction, for which they were promised a connected, center city streetcar network. One-term Mayor Mike McGinn ruefully said there’s no school for mayors. Durkan has faced a rocky learning curve, especially with her fence-sitting on the destructive jobs tax, which City Council passed, then repealed. She is confronted by a city that’s growing much faster than expected. In 2016, officials expected the population to grow by 120,000 over the next two decades. Yet at today’s rate, we could hit that mark by 2022. Most of this is happening in Seattle’s core. Given that, the Center City Connector is a strange place for newfound fiscal probity, especially when immense sums have been spent on social services while the homeless problem only grows worse and ever-more pricey sinecures have been created for bureaucrats at City Hall. This is the time to step up and complete the streetcar line. Then look to best practices elsewhere to speed light rail to Ballard and West Seattle.